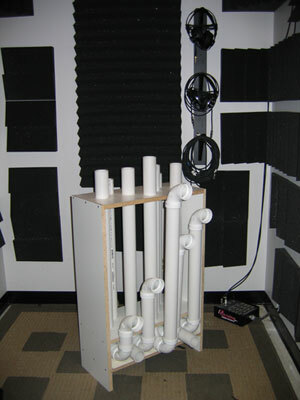 the "tube-o-phone" began as a project for the course, Electronic Music Techniques. The assignment was to design and build an instrument that would later be recorded for use in an electroacoustic composition as well as featured in a percussion ensemble concert. It was built using 2" PVC and scrap cabinet wood. When a PVC tube is struck directly on the top, the sound is created by waves bouncing back and forth from one side of the tube to the other. The frequency of the sound is affected directly by the length of the tube (the longer the tube, the lower the frequency). After the lengths of the tubes were calculated and the design of the instrument itself was done, the building was begun. First, the frame was constructed using cabinet wood and wood screws. Next, the tubes were cut, leaving them a little long so the instrument could be more precisely tuned using a chromatic tuner. The paddles that are used were constructed from two professional ping-pong paddles. The sides of the paddles were cut off and gsffers tape was used to cover the face of the paddles. Grip tape was applied to the handles for a better grip. Special thanks to Dr. Joseph Kozminski, a professor in the Department of Physics at Lewis University, for his technical expertise and help.